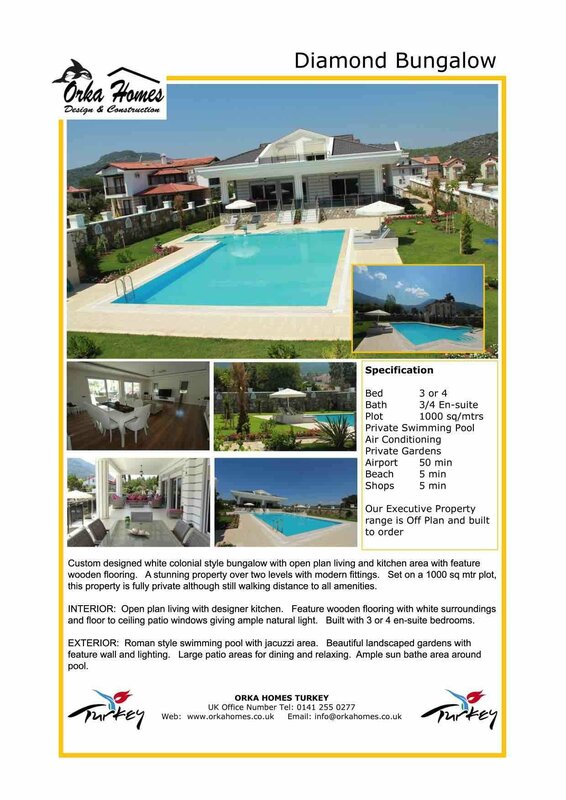 Part of our Custom Built range this is a fantastic villa in Turkey for sale and certainly has the WOW factor both inside and out. Set on a large plot these bungalows are the ultimate in luxury living with the highest specification included as standard. Outside you will find a very large Roman style swimming pool with Jacuzzi area and walled gardens to give you that secluded feeling. With 4 en-suite bedrooms and a large open plan living/dining and kitchen area with floor to ceiling patio windows leading you out onto the swimming pool and patio areas. The swimming pool area is set out with ample sunbathing and al fresco dining areas. There are walk in steps to the large swimming pool. Custom Built with all your own ideas and finishing touches in mind. This property can be customised to have all your ideas and luxuries in mind. Select your own kitchen and bathroom units and suit and with a huge selection of tiles to choose from we are sure to have the perfect ones for you.